The importance of arbitration is increasing rapidly at both international and domestic levels. In Pakistan also, the law and practice of arbitration have developed over the years. The legislative developments which have especially taken place during recent years have cast an impact on the practice of arbitration and led to a major change in the arbitral system of Pakistan. 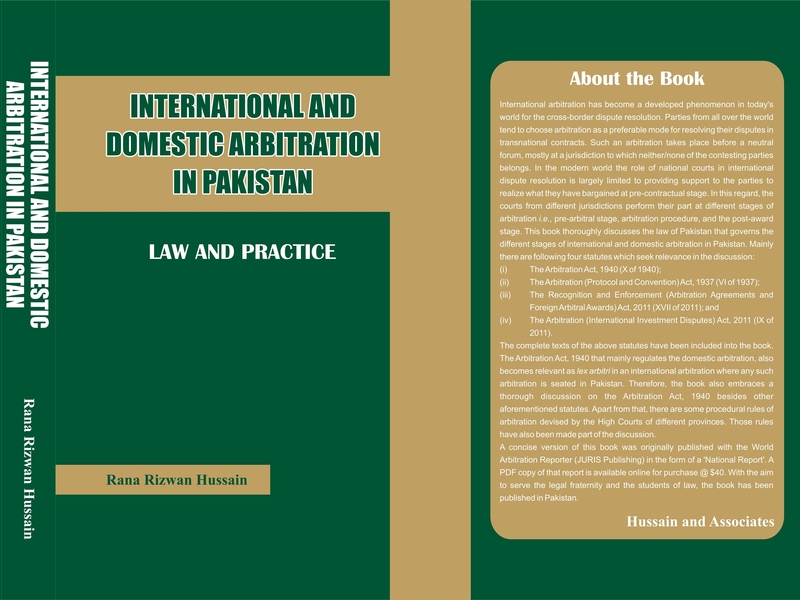 In this backdrop, International and Domestic Arbitration in Pakistan: Law and Practice by Rana Rizwan Hussain, an expository literature on the subject, comes forward as a remarkable effort. The book is divided into thirteen substantive chapters. Each chapter explains its subject matter in a simple and coherent manner effortlessly developing the understanding of the reader. The book opens with a discussion on the nature of arbitration and an engaging exploration of its development and current position in Pakistan. It then progresses through different stages of arbitration, simultaneously discussing the relevant doctrines and theories. The distinction between domestic, foreign, and international arbitration is given at the very beginning of the book, which lays a structural foundation for the comprehension of the rest of its content. Chapter III relates to the arbitration agreement and thoroughly explains its types, validity, effectiveness, interpretation, enforcement, waiver and discharge. There is hardly any aspect which goes unaddressed here. The subject of arbitration agreement is further expanded in Chapter IV which discusses the doctrine of separability. Chapter V elaborates upon the powers of the court and arbitral tribunal with respect to the determination of jurisdiction. Chapter VI distinguishes between the arbitrable and non-arbitrable disputes. Here the author refers back to the contractual and jurisdictional nature of international commercial arbitration discussed in the first chapter, facilitating a better apperception. The matter of non-arbitrability is further analyzed in light of domestic, international and transnational public policy under chapter VII. Chapters VIII to XVIII canvas the constitution of arbitral tribunals, arbitration procedure, arbitration award, recognition and enforcement of award, refusal of enforcement and the setting aside of different types of awards, respectively. The Arbitration (International Investment Disputes) Act 2011; The Arbitration (Protocol and Convention) Act, 1937. Each chapter explicates its topic separately under these sections. This helps the reader to clearly appreciate the discrete and sometimes similar positions adopted by these laws regarding different aspects of arbitration. The methodology of the book is its biggest asset. Statutory provisions are discussed in light of case-law from Pakistan and other jurisdictions. In this way, the author explores the ‘practice’ relating to international and domestic arbitration. Unlike the majority of other commentaries available in Pakistan on different subjects of law, the book does not merely describe the ratio of court decisions, it discusses case-law in factual contexts, sufficiently describing the line of reasoning adopted by the court, which not only engrosses the reader but also makes the comprehension of the practical application of laws more effective. Such a detailed description of case-law provides an added benefit of illustrating some other legal principles besides the subject of arbitration. The mention of contradictory views of courts inter se or of the courts and arbitral tribunals, where beneficial for legal practitioners on one hand, enhances the academic flavor of the book on the other. Other highlights of the book include its footnotes. In this regard, the author carefully attends to the need of general understanding for law students and any foreign readers and provides valuable details which could otherwise not be adjusted in the main text, such as brief details as to the basis of Pakistan’s legal system, structure of superior judiciary, practice as to the ascertainment of meaning of any provision of international law and the general rule of interpretation of statutes, to name a few. Footnotes thoroughly reflect the authorities used by the author and also provide sources for obtaining further information. Another feature of the book is that it bears the texts of all relevant law and rules as appendices. The book is an excellent resource for law students, academics and legal practitioners and therefore a valuable read. I expect that the author will continue his research in further developing the current edition and also produce more work on the subject. The writer is an Assistant Professor of Law at Faculty of Law, University of Central Punjab, Lahore, Pakistan.